Many sites claim to offer a picture perfect hideaway but few can compete with the idyllic shepherd’s hut nestled on the hillside of Treworgey Farm. 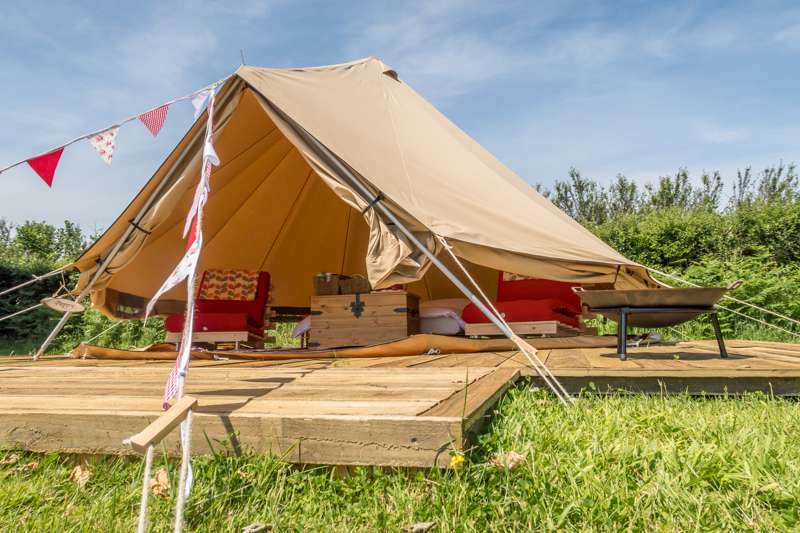 With a truly spectacular location and 150 acres all to yourself, Hideaway Huts is a campsite offering perfect seclusion for anyone lucky enough to bag a prized night in their calendar. 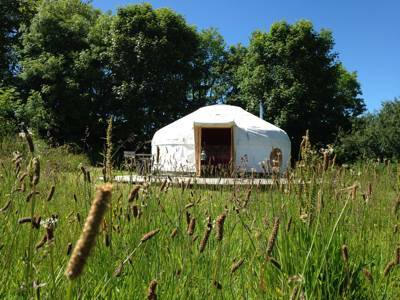 From the cliff-hung coastline of south-west Cornwall, meander up the Looe Valley to a remote farmstead and through the meadow gate to your quaint new four-wheeled home. Overlooking a lush rolling landscape, sculpted by the weaving river beyond, this shepherd’s hut is a glamping haven and a masterpiece of home design. Inside, the light finish and rectangular windows make it feel open and airy, while the log-burning stove and wooden furnishings create a snug, warm atmosphere and a sumptuous sanctuary on those unfortunate days when rain drums upon the roof. Everything you could need is waiting within. Pots, pans, logs, dried foodstuffs, recipes, games, books, maps, toiletries… the list goes on. There’s also a handy folder compiled by Holly and Andy with recommendations on what to do nearby, though its unlikely you’ll be in a rush to leave. On a nice day, fold out the deck chairs and read in the sun, jump in the heated swimming pool, or put on your game face for a quick rally on the tennis court. While the miles of surrounding meadows are free for guests to wander, the more adventurous should saddle up at Treworgey Farm’s licensed riding school, which welcomes all levels of ability and promises a great way to explore the area. Back down the slopes towards the shoreline, the harbour town of Looe is an absorbing place to visit, its quays stacked with crates and lobster baskets. There are several fantastic beaches here, as well as boat trips to one of Cornwall's most diverse island bird sanctuaries. The dramatic heritage coast stretches east to the staggeringly beautiful Fowey estuary, while a short drive north takes you to Bodmin Moor, a miniature wilderness often overshadowed by the larger National Parks. Despite the array of options on your doorstep, don’t plan your holiday with too much haste. The pace of life at Hideaway Huts will remind you that life isn’t about chasing a to-do list of predetermined activities. 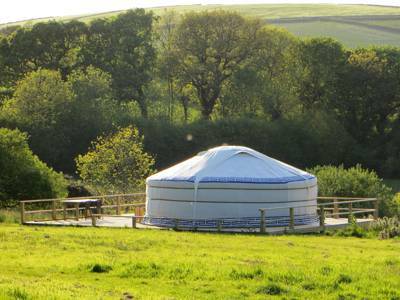 Instead, cherish the exclusivity of a glampsite that's yours alone, meeting with the animals of Treworgey Farm and enjoying the spectacular views. If you don’t manage to make it beyond the nearest village then hey, you’ll just have to go back next year! The hut has a solar-powered inverter for charging phones, etc and excellent solar-powered lighting. It has a double bed, twin gas-ring cooker, table and chairs and a log burner. 20m away is a luxury wash hut with piping hot shower, towels and log burner to keep the space warm. The private composting loo is in a separate room. There is a riding school, tennis court, heated outdoor swimming pool, indoor playroom including table tennis and pool, and an outdoor playground. There's also 150 acres of farmland to roam. Holly and Andy provide a folder full of recommendations and OS maps of the surrounding area. Follow the river back to Looe, full of excellent seafood restaurants and home to several beaches. East Looe beach is the most popular, but try quieter and rocky Second and Sanders Beach, reached through a break in the rocks known as the Khyber Pass. Boat trips run regularly from Looe out to Looe Island (01872 273939), while on a rainy day Old Guildhall Musem (01503 263709) houses maritime history in a 15th-century former court and jail. Further west, Fowey is a wonderfully scenic part of the Heritage Coast. Those really wanting to escape any crowds should head inland to Bodmin Moor. The famous Eden Project (01726 811911) is a 40 minute drive away, while Lanhydrock House (01208 265950) and Antony House (01752 812191) are within half an hour. Hideaway huts also has a host of good cycle routes and footpaths running right past the farm. If you wish to cook for yourself, there is a store of simple dry goods ready for use in the hut and a folder with simple recipe suggestions using the stove top and gas rings. You can shop locally for other ingredients at Duloe Community Shop. Excellent homemade food can be delivered to your hut by the campsite's own ‘Coombe Kitchen’ and you can order groceries to await your arrival in your hut/fridge. Cornish Orchards (01503 269007) is just up the road, selling various juices, ciders, chutneys and more. The excellent Plough Inn (01503 262556) is a 30 minute walk away in the nearest village, while fantastic seafood and other Cornish delicacies can be found in the restaurants of Looe (5 minutes drive). The site is about half an hour west of Plymouth, near Looe. At the Dobwalls roundabout on the A38 (half an hour west of Plymouth, 20 minutes east of Bodmin) turn into Dobwalls village. In the centre of Dobwalls turn right, signed Duloe, passing the Spar and the School as you leave the village. At the T junction in Duloe (4 miles later) turn right along the B3254 towards Looe. Follow the road round hard left corner, down the hill. You pass Cornish Orchards on the left and the campsite is up the next lane on the right. There's a Treworgey sign at the end of the lane. If you get to the railway bridge you've gone to far. Be aware, sat nav routes may appear quicker than above but are much narrower. Sandplace station is the closest, on the branch line between Liskeard and Looe. It is about a mile up the hill from there, around a 15 minutes to walk, though if you give warning Holly or Andy may be around to pick you up. Liskeard is the closest main line station. 3 1/2 hours from London Paddington and about an hour and a half from Penzance. Two fully furnished shepherd’s huts at opposite ends of the farm each with their own separate luxury shower hut and private composting loo.